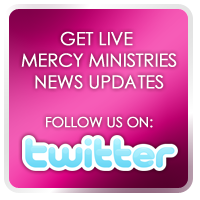 Mercy Ministries News: Graduate Speaks Out About Her Transformed Life and Restored Marriage! Graduate Speaks Out About Her Transformed Life and Restored Marriage! We thought you might like to read a remarkable story of personal transformation, a changed family, and a restored marriage from a graduate who has now dedicated her life to sharing her story with others. Rachel came to Mercy in 2008 battling a drug addiction, depression and suicidal thoughts. She and her husband had been divorced for about four months, and Rachel was heartbroken because her addictions and unhealthy relationships had caused her to lose custody of her children. While at Mercy, Rachel rededicated her life to Christ, and was able to gain freedom from the issues that were controlling her life. At the time of her graduation, Rachel did not think that she and her husband would be able to reconcile as so much damage had been done because of her own poor choices. Here is what Rachael had to say about her experiences, what she learned during her time at Mercy Ministries and how God has completely restored all that was lost. “I was raised in a ‘godly’ home, but when I was 19 years old, my father divorced our family and soon after married my mother’s best friend. I chose to act out by turning to drugs and being promiscuous to find comfort. I soon found myself pregnant and thought the only thing to do was to marry the father. My relationship with my husband had been based on drugs and partying for so long that when we sobered up we had no idea who the other person was. It was a horrible time. I sank into depression and turned to painkillers to numb my internal pain. My unhappiness led me into an extramarital affair and I decided to divorce my husband. During this time, I put my children in countless dangerous situations and my drug addiction led me to allow a long time "friend" and convicted drug dealer to move into my tiny apartment with his two children. My life then took a turn for the worst. I had to have drugs to function, to sleep at night, and then to wake up in the morning. My children were always afraid so my ex husband told me that he had to take the kids. I knew he was right. Soon after, my drug addiction caused me to lose my job. I wanted to die. I felt like I was loosing my mind. I just wanted to give up. After hearing about Mercy from a family member, I knew that this was my last hope. When I arrived at Mercy, it was the day before my 31st birthday. Happy Birthday to me!! I’m pretty sure I had taken some pills on the drive there. I had no idea what to expect and the anxiety overwhelming me was too much to take. I remember seeing a girl in the computer room as she was typing her testimony out because she was going to be graduating that week. She was so beautiful and had a light about her that I wanted. I missed my babies and I cried A LOT but I’m so thankful that I stuck it out. God saved my life through Mercy’s tough love! I needed someone to reach down and pick me up that didn’t have an emotional attachment to my situation. I needed someone to speak TRUTH into my life and pound it into my heart until I believed nothing else. I needed to believe that there was a hope for me and my situation. God met me at Mercy, right where I was, in the middle of the overwhelming mess that I had created for myself. He carried me when I couldn’t carry myself, and when I was strong enough to walk, He walked with me. He shed His light into the dark corners of my heart, and I began to have fun and laugh!! I began to put my identity in Him and this changed everything.